Asimov's family emigrated to America when he was only 3 years old. A precocious child, he began writing stories when he was still a child. Educated at Seth Low Junior College and Columbia University, Asimov received his master's degree in chemistry in 1941. It was at this time that he began contributing short stories to science fiction magazines such as Astounding Science Fiction. His first story, Marooned off Vesta, was published in Amazing Stories in 1939. During World War II, Asimov worked at the U.S. Naval Air Experimental Station in Philadelphia before spending time in the U.S. Army in 1946. He returned to Columbia and took his PhD in chemistry in 1948. The following year he joined the faculty of Boston University School of Medicine as an associate professor of biochemistry. He left in 1958 to concentrate exclusively on his writing. From 1940 until his death, Asimov became the most influential and successful science-fiction writer of the 20th century. His Robot and Foundation series were phenomenally successful and his story Nightfall (1941), has been considered the greatest sci-fi story of all time. Asimov was a prolific writer, producing novels, short stories, essays and articles and a great deal of scientific, non-fictional works. In 1950, he founded Science Fiction Magazine and during his career was the recipient of many awards, including the prestigious Hugo award on many occasions. 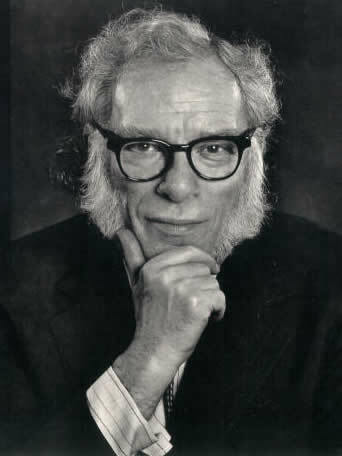 Asimov died from complications brought about by AIDS, which he had contracted during a blood transfusion in 1983. His many works include Strange Playfellow (1940), Foundation (1942), I, Robot (1950), Foundation and Empire (1952), Second Foundation (1953), The Caves of Steel (1954), The End of Eternity (1955), The Naked Sun (1957), Fantastic Voyage (1955), Through a Glass, Clearly (1967), Our World in Space (1974), In Memory Yet Green (1979), In Joy Still Felt (1980), Exploring the Earth and the Cosmos (1982), Foundation and Earth (1986) and Nemesis (1989).